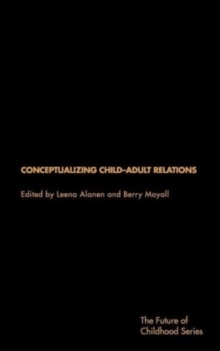 Conceptualising Child-Adult Relations focuses on how children conceptualise and experience child-adult relations. The authors explore the idea of generation as a key to understanding children's agency in intersection with social worlds which are largely organised and ordered by adults. The authors explore two interconnected themes: how children define the division of labour between children and adults, and how far children regard themselves as constituting a seperate group. This book is ground-breaking in its focus on the variety and commonality in children's lives and views across a broad range of contexts. It provides innovative theoretical approaches to the growing study of childhood by homing in on intergenerational relations as a main concept, and draws attention to links across the main sites of children's lives such as the home, neighbourhood and school. Moreover, for policy related issues, this book provides food for thought about the social conditions and status of childhood, and the factors structuring it.